Best-selling conservative author Ann Coulter went on the Alex Jones show Tuesday and slammed Big Tech for trying to censor "the last corners of the internet" which allow conservatives a platform and said that unless these "natural monopolies" start "living under the First Amendment, I think the law should force them to." "Consider how strong liberals consider their arguments. 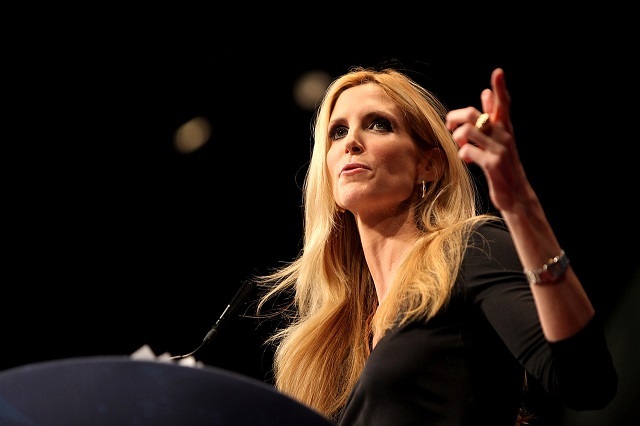 They've got all of the mainstream media, one hundred percent," Coulter said. "ABC, NBC, CBS, all the cable, the major newspapers, the major news magazines, they've got Yahoo, AOL. They have the Swamp, they’ve got Hollywood, they have Silicon Valley. And now they're down to the last corners of the internet." "Oh no! Conservatives can speak to one another, we must shut it off!" Coulter joked. Coulter went on to say these Big Tech companies should be forced to respect the First Amendment and be regulated as the "natural monopolies" they are. "When you have a total monopoly on how people can communicate with one another, we do have legal concepts like 'natural monopolies' and 'utilities,' and unless they start living under the First Amendment, I think the law should force them to," Coulter said. "Right now, the law is written in such a way so that they are simultaneously publishers so they will determine who can be heard and seen on their airwaves ... and are also totally immune from suit." "So, I'm sorry, you don't get those kinds of privileges in a country that still believes in free speech," Coulter said.